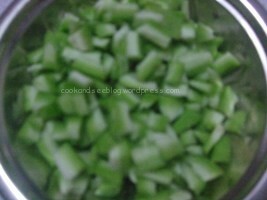 1.Wash the vegetable and cut it into half and remove the seeds,then chop them into pieces. 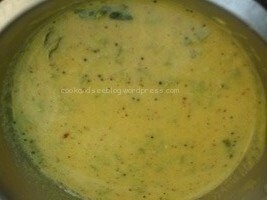 2.Add turmeric powder to the moong dhal and Cook it in the pressure cooker for 4-5 whistles. 3.Grind the grated coconut along with red chillies and cumin seeds into a smooth paste. 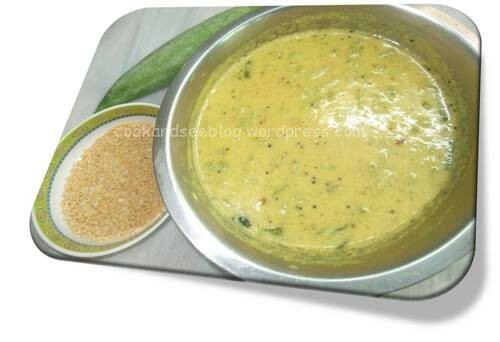 4.Heat the oil in the pan, add mustard seeds, wait till it crackles, add urad dhal, curry leaves and onion, saute it . 5. Now add snake gourd ,salt and water ,close the pan with a lid.cook it in a low flame. 6.After vegetable is cooked enough,add cooked moong dhal and grounded coconut paste to that and mix well. Allow it to boil for 5 minutes. 7.Turn off the stove and serve it with rice.